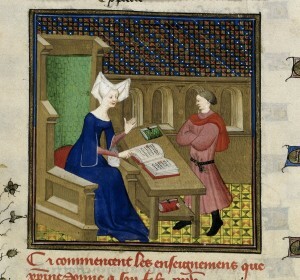 Welcome back to ‘Voices of Early Career Researchers’, a monthly feature on the French History Network blog. Each month we’ll post a short interview with an Early Career Researcher of History, giving you an insight of the different paths that recent PhD holders are following in and outside academia. We invite our interviewees to share their experiences and we hope that the conversation carries on in universities, conferences and social media. This academic year, Voices of ECRs focuses on PhD holders who are now working outside university departments. Our ninth interviewee is Alison Ray who submitted her PhD in 2015 at University College London. She now works at the British Library as Digitisation Officer for the Ancient, Medieval, and Early Modern manuscripts section. Can you tell us a little about your PhD thesis? How did you come to this field? Did you work outside academia before the start of your PhD and if so, did this affect your research interests and your current career? My PhD was entitled ‘The pecia system and its use in the cultural milieu of Paris, c1250-1330’, and examined manuscripts produced in Paris through the pecia system of university book production and how these texts were used by academics and preachers present at the university there. I studied History and English Literature for my undergraduate degree at the University of Glasgow, where I took a module on medieval books and how they were made, and loved it! I then straight away did my MA in Medieval and Renaissance Studies at University College London which offers a focus on medieval book production and palaeography. My course supervisor introduced me to the pecia system and accepted me to stay on in the history department as a PhD student. For my thesis, I looked at over 100 manuscripts in collections at the British Library, Oxbridge college and university libraries, and the Bibliothèque nationale de France, Paris. My palaeography skills and language training in Latin helped me to gather my evidence of user marginalia and to show how pecia manuscripts were taken to England in large numbers, revealing that the university at Paris greatly influenced English intellectual life at that time. My supervisor’s advice and support was also immeasurable! When did you submit your thesis; what did you do in the months following submission and the viva? I submitted my thesis in September 2015, and had my viva that December. I was living in Ireland (my home country) at the time, and moved back to London after my viva for work. Being close to my university was very useful to complete my minor corrections. When and why did you start considering a career outside academia? This may sound very strange, but I never seriously considered working in academia. I taught in the second year of my PhD on at King’s College London, and I enjoyed the experience very much but I was not interested in lecturing as my main career. What fields (outside academia) looked the most appealing and why / how did you feel you would fit into them? With my love of books, I was obviously destined to be a librarian! During my PhD I undertook special collections internships with the London Mathematical Society, Irish Architectural Archive and Archbishop Marsh’s Library, Dublin. I also acted as a research assistant for an author’s factual account of the British royal family during World War II. Gaining practical experience in a wide range of materials was invaluable for my own work and showed potential employers that I was serious about working in the field. What were the challenges you faced during the application and interview processes? Special collections libraries have very individual holdings, and I found it very important to tailor my cover letter and CV to each role I applied for. There are also few positions open at a time, making the application process very competitive. Although I received good feedback from my interviews, I didn’t have as much experience as other candidates who had applied. So, I felt the main challenge was figuring out how to build up my CV and demonstrate my knowledge of the field to employers. Could you tell us a little about your non-academic career so far and your current job? To meet the challenge of building up my CV, I decided to work in roles outside of my chosen field but with duties that were related to what I wanted to do. I was interested in digitisation projects that are currently being run at many libraries, but I didn’t have the IT and technical skills that most roles required. So, in 2015 I worked as a Clerical Officer in the Irish Civil Service, and gained experience in running IT databases, as well as working with different government departments to co-ordinate large projects. After my viva, I worked as a digital archivist for a London architectural firm and further improved my IT and records management skills. I worked there for six months before I got my current role with the British Library as Digitisation Officer for the Ancient, Medieval, and Early Modern manuscripts section. It’s a dream job, and as well as my main role of digitising materials I also contribute to our medieval manuscript blog and Twitter feed (@BLMedieval). I love engaging with our readers through social media, it makes our research more fun and accessible to wider audiences around the world. How has your training as an academic facilitated the transition to a job outside academia? As many special collections are held by academic institutions and universities, I still work very closely with researchers and academic staff. From my own academic background, I can deal with specialised reader requests, and my previous teaching experience helps me to assist in show and tells of our materials to visiting students. I am also now taking a professional qualification in archiving, and knowing how to write essays and reports makes the course much easier to undertake. What advice can you give to graduate students considering a career outside academia? Don’t be afraid to try something different! If you’re interested in a specific field, get the experience you need. I first got an internship through scouting out my university’s careers service and after building my confidence, I contacted libraries directly by sending my CV and asking if I could volunteer. It’s very easy to fit a two-week placement around your studies, or working one day a week. I’ve found that many employers are very understanding of a student’s schedule and will work with you to be flexible around deadlines and study leave. Working and studying at the same time can be very stressful, remember your wellbeing is more important. I have a great support network of friends and family, and being around my loved ones got me through my PhD and the dreaded Post Thesis Stress Disorder!